I got to try out Touch Math for First Grade. 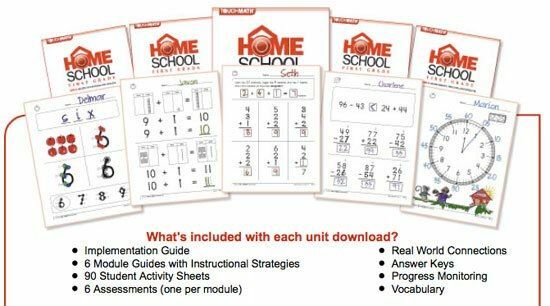 The first grade program is 4 units with each unit costing $59.95 or buy all 4 for $199.95. 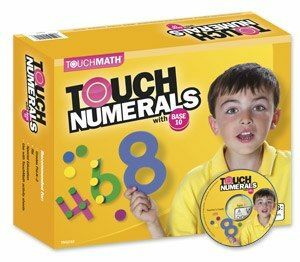 Touch Math also offers manipulative's to go along with their program. We got the FlipCards and they run $19 a set per unit. Also an interactive CD that is $99. We also got the Touch Numerals that run $99 as well. Lastly we got the Student Number Cards that are priced at $24. My 1st grader is my reluctant learner. This was a complete different approach than what we have tried with her. The recommended time by them is 2 times their age. So for Kiya we should be doing it for 12 minutes a day. She is a slow learner though so it usually takes us 30 minutes or so to get through some of the work each day. There are four units that you download and print. They are completely lined out with directions for you as the teacher and for the child. Each one aligns with the set of FlipCards that go with that unit. I really enjoyed how detailed they were. Also the CD's gave lessons that were very easy to follow. The Touch Numerals were a hit as soon as we pulled them out of the box. I will say that it is a bit overwhelming for this OCD mama with ALL of the many pieces that come in this. You have copies of each of the numbers plus several dots. These dots did come with some plastic holders to case them but there were not enough holders for the dots. For having a 1st grader who is not the most organized person it was nightmare at keeping all these dots in one place. We really did love the idea of the point system, it worked really well but took us a bit to get the hang of the larger numbers and remembering where their points were. I also think maybe plastic numbers would be better than foam. Foam tears easily for the numbers like 7 when they get thrown in the box and you try to pull one out. Overall the worksheets were great. There was very detailed instruction to each unit. They were big and bold which kept them interesting to look at. The unit explained everything completely and was really great to use. I loved it because even if you are new teacher or a seasoned one these instructions keep you on track. After each section there are also post tests. I liked those to make sure my kiddo understood what we learned in that lesson. If we did not do well on it we went back to the worksheets and used the CD to do more work on that section. I do like how everything is set up and organized. It flows well with how things should be learned and it follows common core which is a plus to me. I know some homeschool families do not follow any standards but I like to make sure the kids are on track as much as they can be, plus it gives me an idea on what to teach next. One issue I had was the price. It is a bit steep for my budget, although if I had more kids that would be able to use it after her it wouldn't seem so bad since it is a product that I downloaded and can print as many copies off that I want. Also as long as you take care of the manipulatives they will be good to be passed down as well. But like I said for us the foam just was not great. One more thing to add. If I could give Touch Math a suggestion it would be to make a teacher download and then the worksheets download. It was hard to print only worksheets and go through it all so that I didn't waste paper. Ink is not cheap so I do not like to print instructions, instead I can read them from my computer. Disclaimer: I received a free copy of this product through the Schoolhouse Review Crew in exchange for my honest review. I was not required to write a positive review, nor was I compensated in any other way. All opinions expressed are mine or those of my family. I am disclosing this in accordance with FTC Regulations.